As you resume or take on office, you will recognise one of the heaviest and most important burdens on your desk will be your responsibility for Britain’s independent nuclear deterrent. That deterrent exists, as you will know, not as a military weapon but a political one whose very purpose is for it never to be used in anger. It is there to deter aggression against this country and our allies and to counter any nuclear blackmail which would threaten Britain’s essential interests or survival . It is committed to NATO and with the French and American deterrents plays a crucial and successful part in the defence of the Alliance. You and your Defence Secretary have responsibility for the operation, targeting and conduct of the submarines carrying the Trident D5 missiles constantly on patrol. You will also, importantly, be responsible for the decision next year whether or not to go ahead with the ‘Main Gate’ decision on triggering the building of 4 new submarines necessary to continue the deterrent and replace the Vanguard submarines soon coming to the end of their lives. The ‘Main Gate’ decision was postponed to 2016 by the former Coalition government but, due to the age and fragility of the existing fleet, you will be all too aware that the decision cannot be delayed further. A decision not to go ahead would effectively end Britain’s nuclear deterrent since no replacement submarine would be available. It can also be argued that patrolling would have to stop immediately since the deterrent’s effectiveness and credibility in the eyes of both adversaries and allies would be shredded. It is supremely important to recognize that it is inconceivable that Britain could in future resume its deterrent if there was a negative decision at the ‘Main Gate’. Such a decision not to proceed with main gate pretty well immediately would therefore be irreversible. You will be aware that both the Conservative and Labour Parties are publicly committed to the deterrent and to Continuous at Sea Deterrence (CASD). This involves one submarine being on patrol at any time, whereby it is undetectable and invulnerable . The Liberal Democrat Party has some reservations about word ‘continuous’ but Sir Nick Harvey, former Liberal Democrat Minister for the Armed Forces, has stated that two submarines should be ordered anyway. The Scottish National Party is publicly committed to abandoning the successor to the Vanguard class submarines but it should be noted that its Party Conference embraced the idea of an independent Scotland being in NATO. NATO’s Strategic Concept explicitly “commits NATO to the goal of creating the conditions for a world without nuclear weapons – but reconfirms that, as long as there are nuclear weapons in the world, NATO will remain a nuclear alliance.” UKIP supports CASD, as do the Ulster Unionists, while the Welsh Nationalists and the Green Party oppose nuclear deterrence. If the UK Government decided there was no cheaper alternative for an effective nuclear weapons system, and you had to choose between keeping the current nuclear weapons system Or giving up nuclear weapons altogether which of the following statements would come closest to your view? Arising from Liberal Democrat demands, and enshrined in the Coalition Agreement, a full study of the alternatives to Trident and CASD was set up by the Cabinet Office at the request of the MOD. . It published its report on 16 July 2013 and submitted the findings to Rt Hon Danny Alexander MP, Chief Secretary to the Treasury. It exhaustively reviewed all the alternative systems to Continuous At Sea Deterrence. Even before the Trident Alternatives Review had reported another review had been initiated, supported by the NGO BASIC (British American Security Information Council) entitled ‘An independent, cross-party inquiry to examine UK nuclear weapons policy’. BASIC describes itself as ‘a small but influential think-tank with one very big idea: we want a world free from the threat of nuclear weapons’. The members of their Commission were hand-picked and very distinguished and represented different viewpoints on deterrence. The Report of the BASIC Commission was published in July 2014. Both Reports make it clear that the various alternatives to Trident based Continuous At Sea Deterrence have serious weaknesses and are rejected. These include using Cruise Missiles on Astute Class attack submarines (Weaknesses; retro-fitting and redesigning the current models, facing a problem of distances to target, the complexity and cost of building a new warhead and a brand new missile and the vulnerability of any such missile). Another option proposed is using free-fall bombs (abandoned in the UK by the 1998 Strategic Defence Review) to be carried by adapted F35 Joint Strike Fighters flying from very expensively modified aircraft carriers. ( Weaknesses; The vulnerability of the platforms in a nuclear role, the cost of adapting the Carriers, the cost of inventing a new warhead for the American bomb, the inadequate reach of the F35 system for this mission, and the unquantified cost of the project). The other alternative floated is non-continuous patrolling by Trident submarines. Whilst superficially attractive and speculatively cost-reducing, the Trident Alternatives Review ruled it out on good practical grounds. It could escalate a crisis if submarines were seen to be deployed, the training of crews would degrade compromising the surety of operations, access seaways could be blocked by an adversary before deployment, and the ambiguity inherent in deployment might alarm an opponent. As you contemplate the decision on ‘Main Gate’, a blizzard of arguments will seek to influence your government’s decision. These will largely come from those who have been frustrated by the definitive conclusions of the recent Reviews. Examples follow. Trident Submarine Successor will stimulate proliferation? On the contrary, the deep reductions in Britain’s deterrent made by successive governments have produced no reciprocation from other nuclear weapon or aspiring nuclear weapon powers. Britain now has reduced to only one system, made dramatic reductions in the number of missiles and warheads per submarine combined with de-targetting and warning times extensions. This, and severe reductions by the US and France, have been accompanied by increases in the nuclear capabilities of China, India, Pakistan and North Korea. Russia too has embarked on a programme to modernise its nuclear forces and has made threatening statements about their use. There is a need for yet another Review because the others had ‘erroneous assumptions’? There have now been Reviews of the need for the deterrent in 2006, 2010, 2013, and 2014. All have been conclusive. This demand is merely another attempt to get the answer which has been repeatedly rejected. Only the USA , France and the UK have Continuous At Sea Deterrence? The fact is that both Russia and China have Inter Continental Ballistic Missiles on high alert (the UK does not) and both are moving to CASD. Trident expenditure is a crippling cost at this time of austerity? Critics of the Trident programme invent ever larger fictional figures for the whole life costs of the renewal project. In fact the total cost throughout a life of up to 2060 would be an average of around £2billion a year (taking a lifetime estimate of £80billion). In comparison the British National Health Service costs £2.5billion A WEEK. The nuclear deterrent does not address new threats such as terrorism, hybrid and cyber attacks and jihadi individuals? Correct, but irrelevant. Other deterrents and capabilities are needed for these threats but only the nuclear deterrent can deter nuclear blackmail and nuclear armed aggressor states including any state which were to consider providing nuclear weapons to terrorist organizations. Abandoning the deterrent by not ordering new Trident submarines would save a vast amount of money at a time of limited public spending and a squeezed Defence budget? This facile argument deployed to justify expenditure on other armed forces or social programmes ignores the incontrovertible fact that cancellation is not a cost-free option. 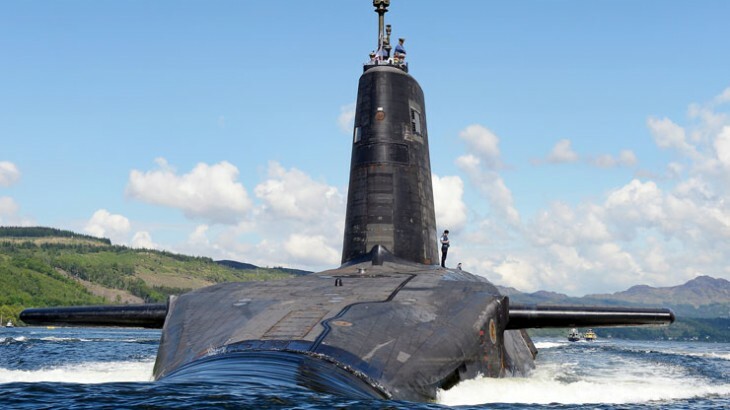 Decommissioning deterrent submarines and the broad infrastructure supporting the system would produce very substantial and recurring costs from the moment the decision not to proceed is taken. Prime Minister, the decision on ‘Main Gate’ next year will be one of the most important ones to be taken by this generation of political leaders. Its consequences will be felt inside and outside of the country for many years to come. Allies and adversaries both current and potential will have an interest in the outcome. Please also remember this. The decision ahead of you will be irrevocable; it is inconceivable, whatever grave threat emerges in the future, that the deterrent could be reconstituted if abandoned now or left to wither. It is impossible to tell what threats may emerge over the more than thirty years of the new generation of submarines and therefore how safe future generations will be. To abandon Trident now and for good in the hope that no threat will emerge over that lengthy period would be take an enormous gamble on behalf of generations yet to be born. The United Kingdom has made reductions in its nuclear arsenal proportionately greater than any other nuclear weapons power. That has represented a huge contribution towards nuclear disarmament. We should stand ready to do more – but only if it can be conclusively shown that it does not compromise minimum levels of nuclear deterrence and would simultaneously contribute to multilateral global disarmament. In an uncertain world where some powers are now displaying a worrying faith in nuclear weapons as an instrument of policy and influence, it would be, in our opinion, irresponsible folly to abandon Britain’s own independent deterrent. That fact indeed encapsulates the enormity of the decision which the Main Gate decision will mean for the security and ultimately the survival of our nation. Prime Minister, we strongly urge you to bear the above in mind as you lead Parliament in the debate on ‘Main Gate’.